It’s really hard to find a good picture to use for FFV. All the “official” (but non-Amano) art is super-deformed, so that will be the primary basis. I think this fan art does a pretty accurate job of translating their freelancer outfits, except I’m not sure where Galuf is in the image. And here’s a picture of the characters as dogs, for some reason. Bartz: Possibly the most boring outfit ever for one of the most boring characters ever. It’s just…nothingness. It’s skin-colored pants and shirt with a blue tunic over it. I assume the blue tunic is just so we know he’s not naked, because it seems a little flashy for Bartz. Have always liked his hair though, it’s the like the reverse Flock of Seagulls ‘do. 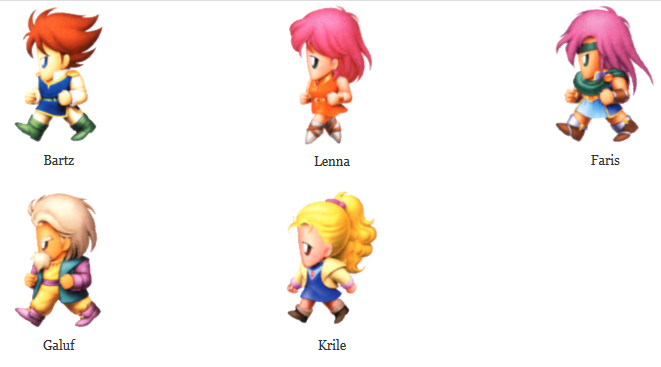 Lenna: Lenna was rocking the short orange dress way before Selphie tried to. Before getting hooked on What’s Not to Wear?, I would have said “Pink hair with orange dress! ?” but I’ve learned that different colors apparently rarely clash, so I guess it’s okay. Otherwise, very straightforward and boring as well. A belt, a necklace, and what appear to be (in the super-deformed picture) ballet shoes? Not sure why, but I like that random addition. Faris: I don’t hate Faris’s outfit, but it doesn’t really scream “pirate” to me, despite the fact that she was living as a pirate king prior to joining up with Bartz. The scarfy-shoulder thing is pretty badass and also serves the double function of hiding her chest (double pun intended). Her super-deformed shoes appear to be suede boots with metal blades on top, which is possibly the coolest thing ever. Galuf: I’m sure Joey’ll give him guff just for being old, but his outfit is one of the better ones in FFV. The yellow/purple/blue color combo is interesting but not nauseating, it seems comfortable and functional, but has a little pop thanks to the pointy vest shoulders. Also, props for being one of the few FF characters to be able to grow a beard. Krile: Krile gets points for having amazing hair–look at that ponytail! It’s so wavy and thick. Otherwise, another boring outfit. Her shoulders are pointy and match her grandpa’s, which is cute, but minus points for lack of originality. In the iOS remake, her character portrait is disgustingly sexualized, considering she’s just a little kid. So extra minus points for that abomination. Overall: Final Fantasy V’s outfits are just dull, boring, and uninspired–possibly because they spend most of their time dressed up in job class outfits, but that’s no excuse for not having a good base to start from. Unless we want to go into the billion different job outfits. This is the only game with named characters that I haven’t played and I’ve realized they have the dumbest names in the series. I’m also not sure which person is which. Bartz: The hair does have a weird wispy appeal to it. Some product, but not ridiculously spiky like some later protagonists. Lenna: I like orange dresses but minus points for pink hair. Also is she a ballerina? Why is she the only one on her tippytoes? Gauf: I don’t hate the Old Man hair/beard but his purple/turquoise jacket/blazer seems a bit Lane Bryant too me. I suspect there are shoulder pads beneath it. Faris: Her outfit isn’t terrible, but I agree that it won’t get her much pirate reputation. I feel like no one would join her crew because she’s a woman, and her pink hair just makes it worse. The character artwork makes her seem so much more pirate-like, but it doesn’t match her sprite whatsoever. Krile: What a weird name. Is it pronounced like the animal that whales eat? How old is she? Her hair does look voluminous so points for that. Overall: I’m not too impressed but not disgusted either. It would take too long to judge all the different jobs, but overall I think they have some good looks that are classic Final Fantasy. I’m going to bump up their score based on this image: look at that tiger hat! I don’t know these characters, so the first image I saw was the characters-as-dogs fan art. I am really interested in playing that game. Or, adopting these dogs. I can’t stop laughing at whomever that is supposed to be on the bottom, but would def win 1st place at Westminster. Moving on. Bartz: I think his approach here is sort of like what I’ve heard about makeup: play up your eyes or your lips, but don’t do both. He’s favored his coif over his tunic, because focusing on both would be too much for us to handle. The decision was a success because you both noticed what great hair he has…and was precisely what he wanted you to say. 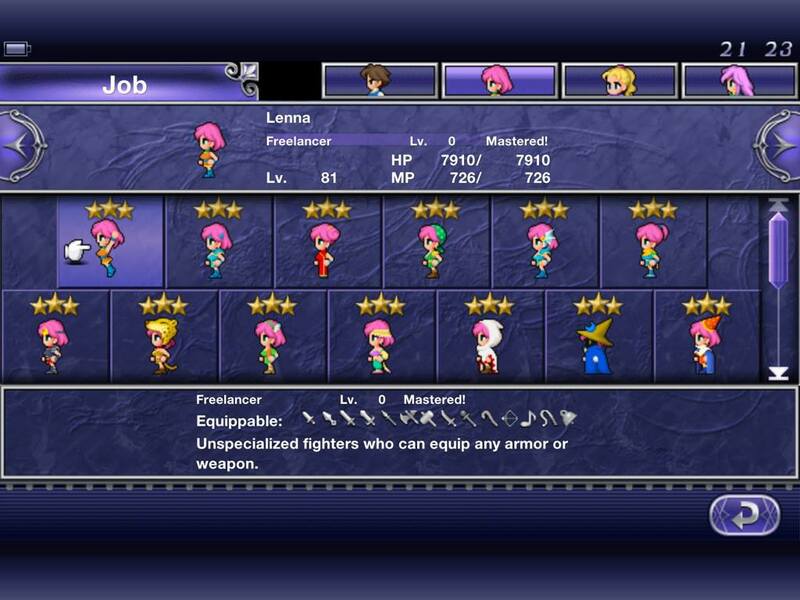 Lenna: She’s cute, but I don’t think she stands out. I don’t quite see what she’s going for…if the dress was maybe a one shoulder number, or perhaps draped a different way, she’d have a bit of a Roman/Gladiator thing happening with the strappy shoes. Faris: I would have never known she was supposed to be a pirate. That scarf is the worst. I feel strangled just looking at it. Galuf: Is he wearing jammies and a robe? He IS pretty old, so maybe he is, and if so…good for him. Kickin’ it comfy style. Krile: One of these things is not like the others. Is she on her way to math class? She looks like the kid that gets dragged along to grownup places because mom and dad won’t get a babysitter. Her outfit is a uniform and from my Catholic high school background, I know that uniforms do not reflect personal style…so, she’s neutral in my book. Overall: I’m disappointed by the lack of effort, but impressed by the amount of hair. This entry was posted in Fashion, Fashion Panel, Video Games and tagged Final Fantasy, Final Fantasy V. Bookmark the permalink.